A chambray shirt is the epitome of cool and easy breezy summer dressing. it is a timeless piece that basically goes well with anything- worn as it is or as a layer (like how i did it) and paired with jeans, shorts, skirts or skorts and you're sure to look as polished as wearing it with slacks or palazzo pants and pumps for office wear. i've been on the look out for the perfect pale blue chambray shirt without actually hurting my budget so when i saw this hanging from the racks of South Shores boutique in Parkmall, i knew i just had to get it. I love the intricate embroidery on the shoulder area and the "paleness" of the top. It's just what I've always wanted! I paired this chambray shirt with a navy blue medium rise ankle pants from Basic House. It's made of stretch material but it doesn't really give you that constricting feeling like what most skinny pants i've tried before. It sits perfectly on my waist and the length is just right! as what i've mentioned in Instagram, this pair is becoming a fast favorite! i've been reaching for it (as well as this chambray top) more often than i'd like to. i wouldn't really want them retiring prematurely. yes? haha! 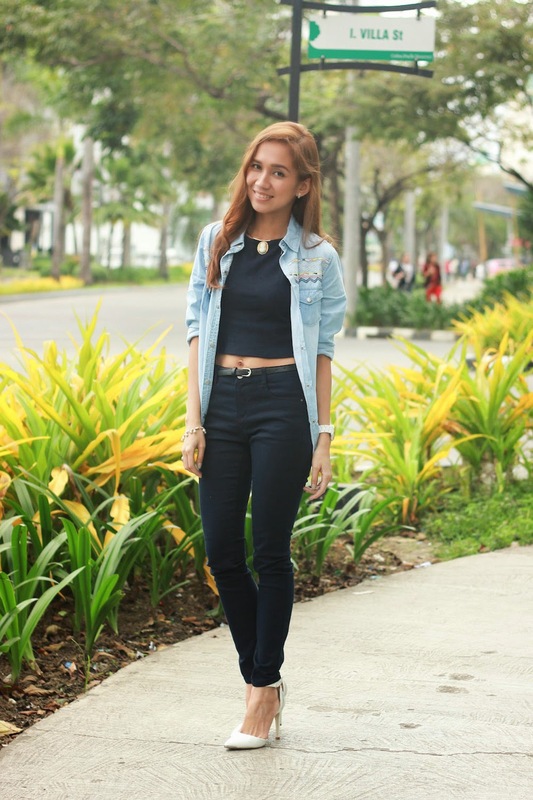 oh and, like what i said in my previous post, this is what i wore to the LEE Philippines DIY Denim Workshop (read here.) to know more about the newly opened Basic House, read here and to see what went down during the opening, click here. do watch out for more of my Personal Style Staple posts! Love that chambray shirt! I agree it's such a style must have. You look so chic and modern. Love it. I love the entire outfit! I love how simple and chic it is. oh wow this outfit is just perfection! i love the black jeans styled with that basic top but how you dressed it up with heels and added a twist with that amazing jacket! your have great taste!